In the lead up to the NSW election on 28 March 2015 groups have been lobbying for their agendas. Human Service peaks and community groups get drawn into this pre-election “we are listening” game by the possibility that they may get a much needed reform up against the competing demands for resources. After the election often little changes for the wicked problems covered by the community sector ask. This ISV has bought together the election asks from across the sector not as a last minute lobbying guide, although you can use it for that, but rather as an overview of what issues the incoming government needs to be pushed to address over the next four years. 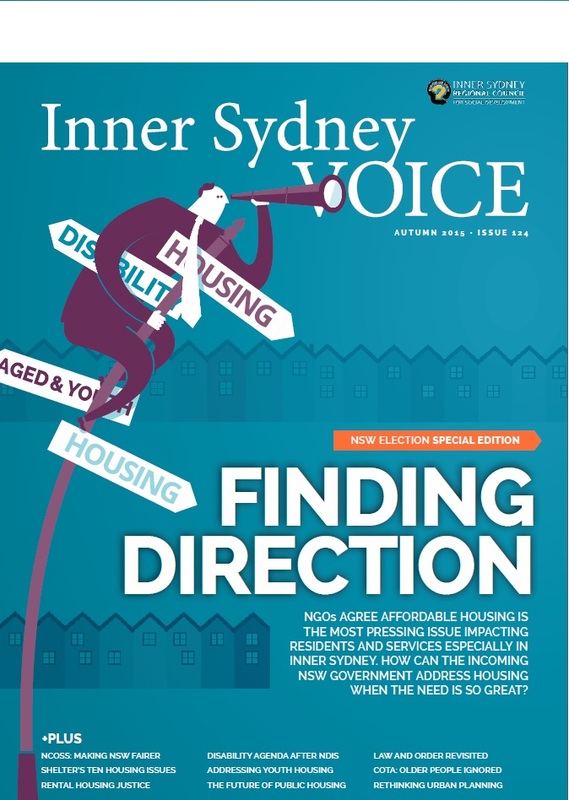 It did not start out to be the ISV housing edition, but it became one when housing emerged as the common thread through the election asks as welfare policy confronts Sydney’s expensive real estate with insufficient low income housing! If you do not have appropriate stable housing it is difficult to deal with other issues. NCOSS want everyone to discuss the issue of poverty and disadvantage in NSW because as they remind us; Any of us are just one step away. They have a campaign website with resources for 13 issues they have identified as needing to be addressed. Working together for a fairer NSW covers the NCOSS election agenda. Shelter NSW in Housing at the right price, in the right place, with the right amenity raise ten key housing issues government must address, from building 100,000 affordable houses to stopping the erosion of affordable rental stock. The Tenants Union compliments this in Rental reform for housing justice with primarily a focus on the problems facing private renters. The future of public housing comments on the government proposal to move more tenants through social housing into the private rental market. In Five foundations for youth housingYfoundation explores the interaction between youth housing and other factors impacting youth while in Seen but not heard: older people ignored COTA NSW look at issues facing older people including the need to address housing insecurity among older people. Disability agenda for the NSW Government looks at the disability challenges not covered by the NDIS including the need for social housing and low / no interest home loans. Spring 2014’s ISV introduced the Community Charter for Good Planning in NSW produced for the NSW election. Achieving effective strategic urban and regional planning explores how one aspect the planning system could be changed in line with that Charter. No reason for a ‘law and order’ election revisits falling crime statistics and suggests areas requiring greater focus by government including domestic violence and prisoner rehabilitation programs. Community Justice Centres: The Road less travelled is the story of an inner city Melbourne program run by the innovative Neighbourhood Justice Centre that many would like to see the NSW Government roll out. Finally as Westconnex seeks to extend Sydney’s road network we reprint a Reply to Freeway Lobby – From the Vault – Inner Voice May 1978.